EA Sports have announced FIFA 19 TOTW 19, and there is an unexpected Irish striker amongst the ranks. Luton Town's James Collins has been included in the squad, being rewarded for his hat trick against Peterborough last weekend. That lifted his side to second in the League One table, only one point behind leaders Portsmouth. Collins has been capped by the Republic of Ireland at underage level, winning the last of his 12 u21 caps in 2012. He has been an important player for Luton this season, scoring 14 goals in the league so far. The 28-year old would certainly be one to keep an eye on moving forward, especially if Luton man to gain promotion to The Championship. His stats on this in-form card are fantastic, with an 81 overall rating made even more impressive by his mix of pace, shooting and physicality. Collins in joined by a number of eye-catching players in the squad. The Luka Modric and Kylian Mbappe items are the ones that will immediately draw your attention, while Cavani's 91-rated edition is also set to be hugely popular. Mbappe has proven to be one of the most sought after (and expensive) players in this year's games, and FIFA enthusiasts will no doubt be intrigued by his move to a more central position in this team of the week. Elsewhere, Leon Goretzka is an incredibly well-balanced player to have in your midfield, while Atalanta's Zapata is also an intriguing option. Laurent Kosicenly has been rewarded for his goalscoring exploits against Chelsea last weekend, while Fabian Schar's unlikely brace against Cardiff City also earns him a spot in the team. They are the only Premier League representatives in this week's squad. 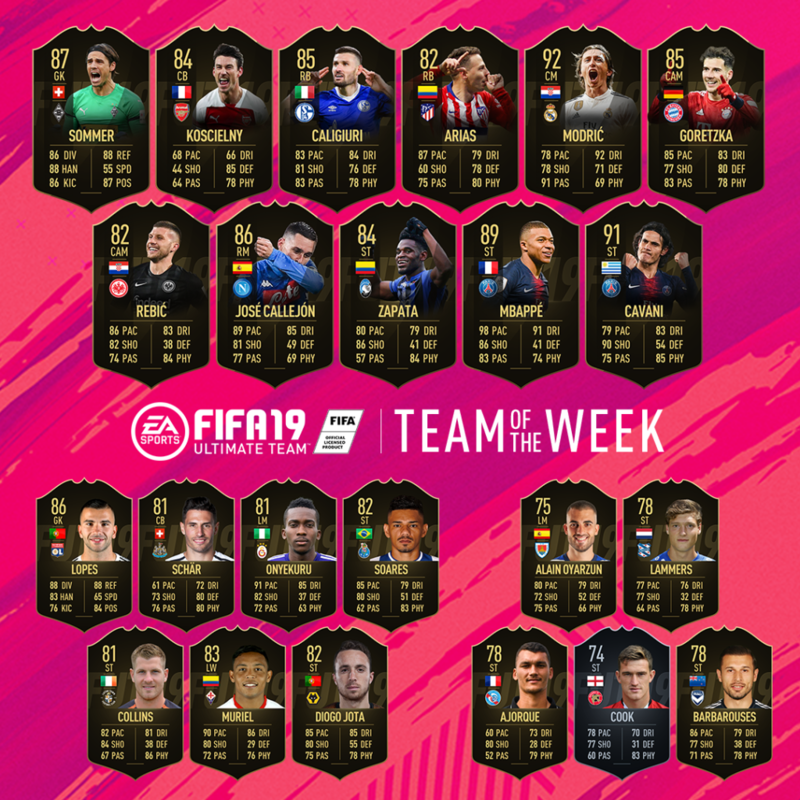 FIFA 19 TOTW 19 items will be available in packs from 6pm GMT this evening.